Standards for classifying building elements have been around for some times, but building information modeling gives us new perspectives for using them. There is a handful of these classifications currently in use. The Construction Specifications Institute produce the MasterFormat and UniFormat, used in United States and Canada. The Construction Project Information Committee in the United Kingdom provides Uniclass and Uniclass 2. And the “Catalogue des articles normalisés” was used in Switzerland even before computers were able to manage it. Revit provides two built-in type parameters to manage such classification systems, the Assembly Code and the Assembly Description. These parameters allow us to link any Revit type to an existing classification system. 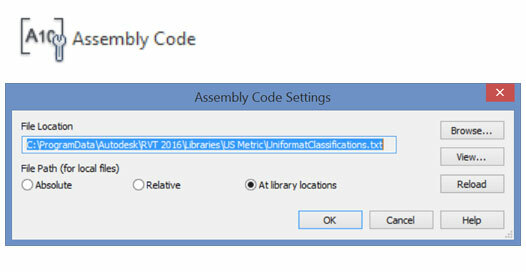 This classification system can be loaded in Revit through the Assembly Code interface. The Classification Code is the number associated with each item in a given classification. It is linked to the Assembly Code in Revit. The Description is the text associated with each item of the classification. Once we add an Assembly Code to a Revit type, this description appears in the Assembly Desciption. The Rank define the hierarchy of the item in the classification. This allows Revit to display any linked classification in a tree view. Finally, the Revit category Id allows us to create a first mapping between classification items and Revit categories. 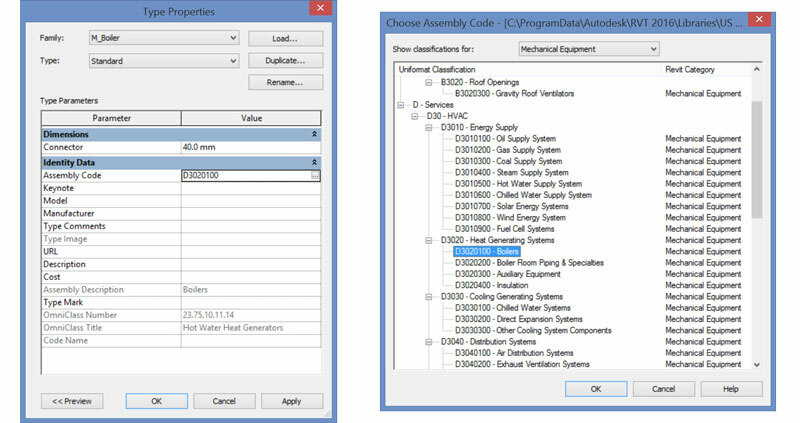 This allow us to filter by Revit category while assigning Assembly Code. To create such a mapping, we need the list of Revit categories. To extract this, I run a small routine to write every built-in Revit category to a .csv file. Along the way, I find some interesting properties of these categories. For example, the IsCuttable property list cuttable categories, something I was talking about in a previous post. But most important here is an exhaustive list of all Revit categories, along with their Id, a prerequisite to create relations between Revit categories and classifications items. These relations allows us to filter by category while assigning Assembly Codes. You can find here the .csv file with all Revit categories, along with the code used to create it.